The KAWS Companion says annyeong haseyo. 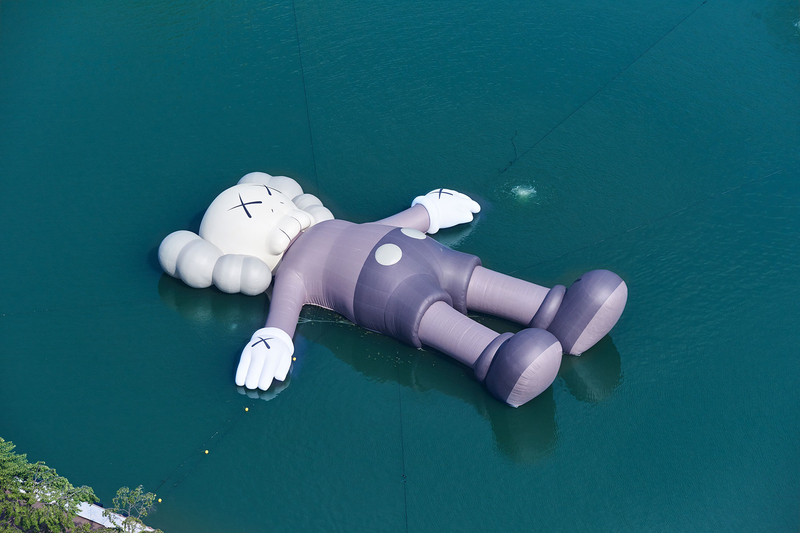 Continuing his rollout of large-scale art, KAWS recently launched his latest KAWS:HOLIDAY sculpture in Seoul, Korea. Announced last month, the 28-meter art installation was created in collaboration with LOTTE and AllRightsReserved and will float in Seoul’s Seokchon Lake until August 19. Surrounding the floating Companion is a seating area with themed parasols and beach chairs, along with a photo tower for picturesque aerial shots. The unorthodox large form piece is accompanied by a capsule of special edition products to celebrate the collaboration. Centered around pool ready items, the range includes a KAWS:HOLIDAY replica bath toy, a floating bed, T-shirts, umbrella, and towel. With news of the exclusive merch range, a large crowd formed hours in advance looking to be the first to get their hands on the special items. Despite the long queue, those waiting in line were in good spirits with KAWS making an appearance to greet eager fans. Check out the launch of the KAWS:HOLIDAY sculpture above and shop all the accompanying merch exclusively now at DING DONG Takuhaibin, CLOT and LOTTE World Mall. In case you missed it, the Dior x KAWS pink BFF plush recently landed on StockX for $9,999,999 USD. A successor to the X70. Will we see a Batman cameo?